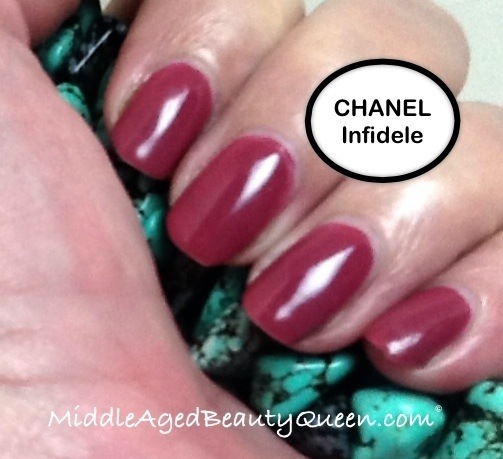 CHANEL Infidele is possibly my Most favorite CHANEL, after May, of course. It is a dusty, dark pink-ish leaning a bit on the maroon side. 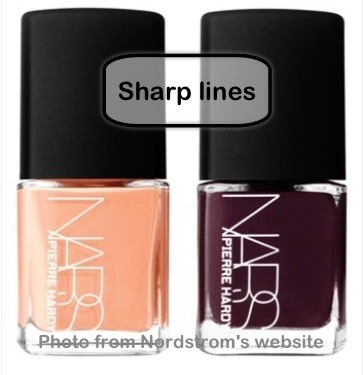 The formula was a joy to apply, I used 2 thin coats with a top coat. No fussiness with this formula. I know CHANEL has made some changes in their make up department personnel and I can see a real difference in the formula of polishes I’ve bought this year compared to polishes I’ve bought in the past. All the ones I’ve bought this year have been a dream to apply, they wear very well, I’ve had Infidele on for 5 days now and it looks just as good as the day I painted my nails. Jilly hates my little test boxes in these pictures, but if I don’t put them on, I will never remember which polish is which. So, if you don’t like them either, I’m sorry, but that is why I do it. I’ll try to find a more attractive way of identifying the polish. 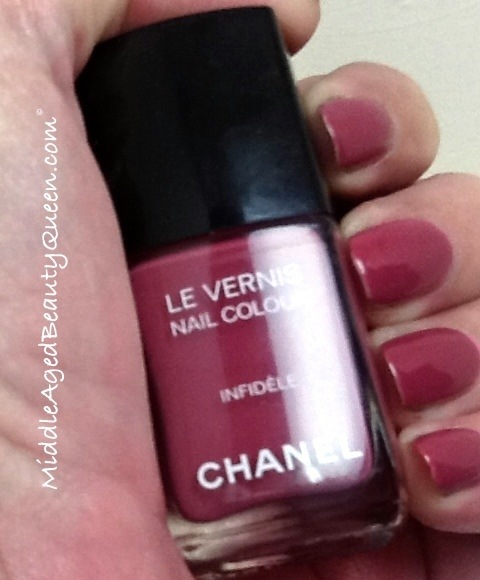 But back to CHANEL Infidele, I am in love with this one and I give it 5/5 stars🌟🌟🌟🌟🌟. I could not find a reason to mark it down. You can find CHANEL polishes at Nordstrom . 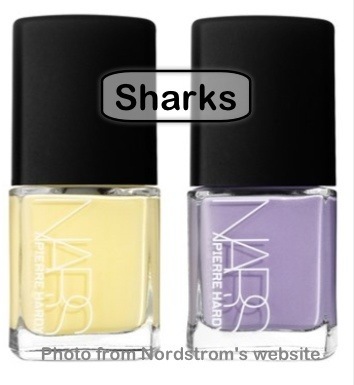 Chanel does not show up in Nordstrom’s nail polish search, you have to search CHANEL and then go from there. You can also find Infidele on the CHANEL website. It is not a LE color so it should be easy to find. The price is $27. 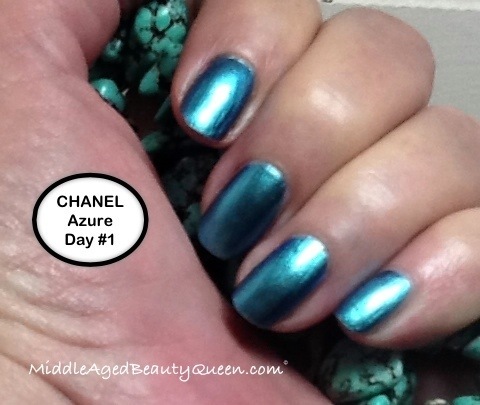 I did try to find a dupe for this one, as I do for all CHANEL polishes. 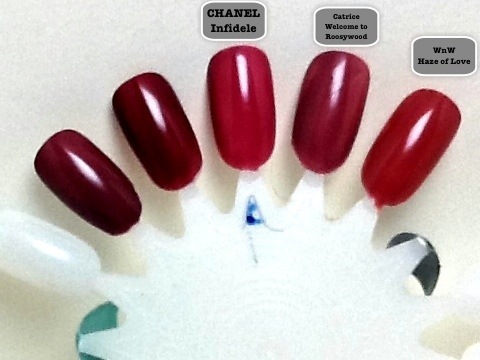 Infidele is in the middle (it has the ink mark below it), to the right is Catrice Welcome toRoosywood. This was the closest match I could find to Infidele. Catrice is a brand sold in the UK and Germany. Next to the Catrice is a Wet n Wild Mega Last in Haze of Love. They look similar in the picture but Haze of Love is much more brown than pink-ish. If I do come across a closer dupe to Infidele of course I will share it with you here. 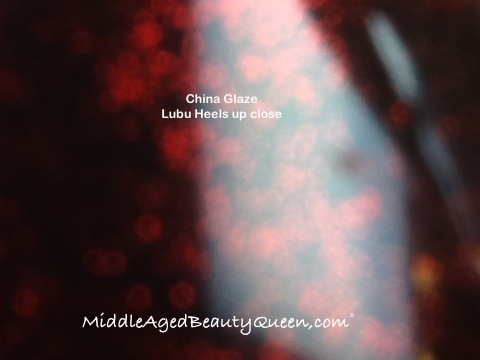 Lubu Heels from China Glaze. 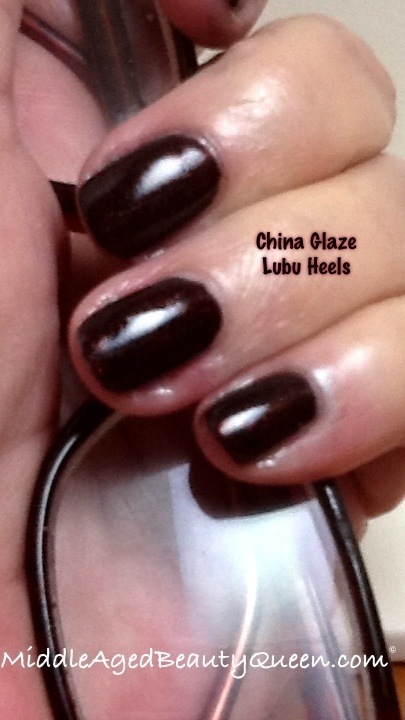 It isn’t often I talk about China Glaze on this blog for the simple fact, I don’t own a lot of China Glaze (CG). 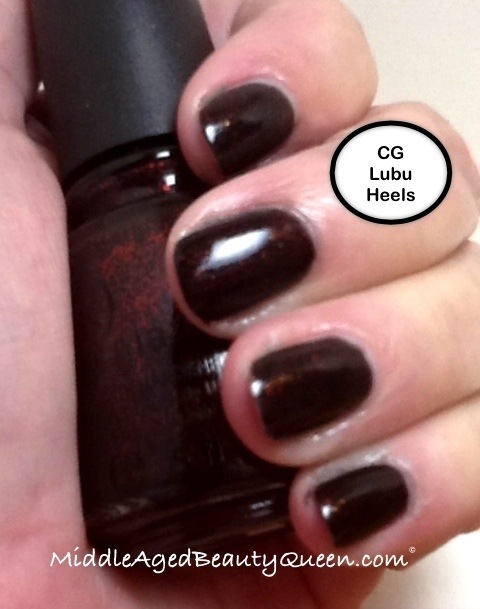 I was in Sally’s the other day and for some reason, I’m not quite sure they said I could pick out a free CG polish from a tub of polishes and in there was Lubu Heels. I had to pick this one up becaue of Miss Holly Berries, whom I’m sure you all watch on YT and read her blog. 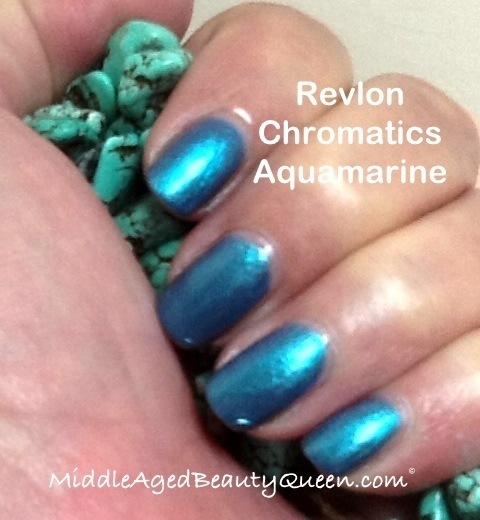 This is one of her favorite polishes. And now I know why. It is a charcoal gray base with bright red glitter. The first coat seems a bit dull but the second coat brings it all together into a gorgeouseness of nails. Yes, I’ve brought back the word gorgeousness for this polish. I wore this for 3 plus days, no chips, very little sign of chip wear and even though it is spring time, I got more compliments on this polish than I think any other polish I’ve ever worn. It is that beautiful. The pictures do not do it justice. The formula is smooth, easy to apply, you don’t have to dig around for the glitter, it was easy to remove and I will be wearing this one again and again. So thanks to Holly I now have a new favorite CG polish. As much as I love it, it wasn’t perfect so I couldn’t give it a 5/5. But it’s still a great polish and if you can find it, especially free it’s a good one to have in your collection. Let me know if you pick it up and what you think of it. This offer includes all Zoya including Pixie Dust, and expires May 31st. Good Luck. Available online at http://www.zoya.com only. Continental USA only. Offer valid thru 5/31/13. Offer applies to all Zoya Nail Polish Color, including PixieDust. Not valid in conjunction with other coupons, codes or promotions. Returns or exchanges of promotional items not permitted. Art of Beauty is not responsible for incorrect addresses, credit card entry errors or errors associated with declined credit cards . In the event of larger than expected volume of orders, please allow up to 4 weeks for shipping. 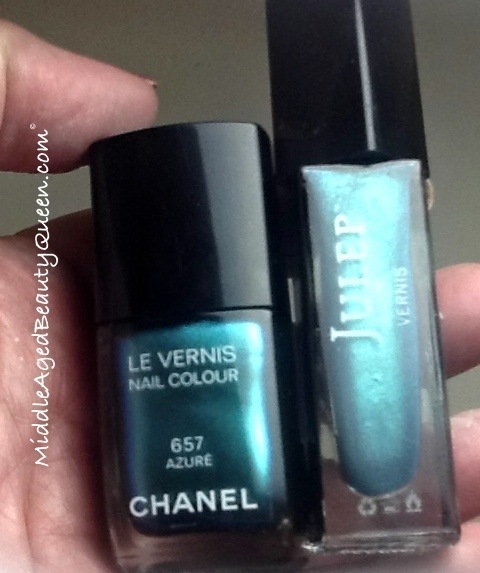 CHANEL Azure on the left and Julep Megan on the right are dead on dupes of each other. I know from the picture of the bottles they don’t look to be exact, but they are. The formula for the CHANEL is a lot better than the formula on the Julep. If you do not add enough polish onto the Julep brush to paint your nail, it becomes something like trying to paint gum onto your nails. Of course, the CHANEL formula does not do that. These are both painted with 2 coats of polish and as you can see they are identical to each other. The only difference being price. I broke the price down per ounce, because the Julep bottle holds so little polish it wouldn’t be fair to compare $27 to a $14 bottle of Julep. CHANEL polish come in .4 ounce bottles. Julep polish comes in .27 ounce bottles. The per ounce price breaks down to CHANEL at $67.50 per ounce and Julep at $51.85 per ounce. So yes, they are dupes to each other but for such a small difference in the ounce per price, I’d take the CHANEL over a Julep any day. 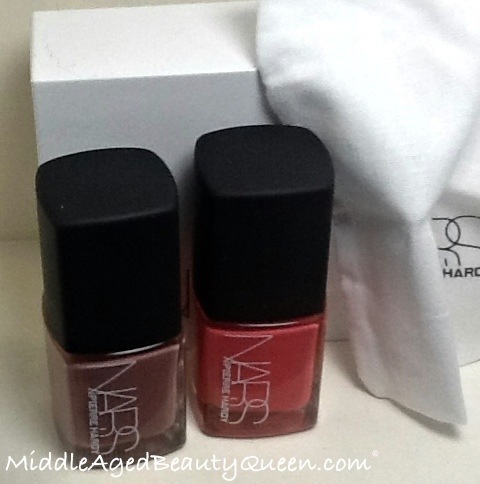 With part of my birthday cash I bought a Nars Pierre Hardy Set. The packaging on this is adorable as the 2 bottles of nail polish are nestled into a “shoe” box, complete with a dust cover bag. 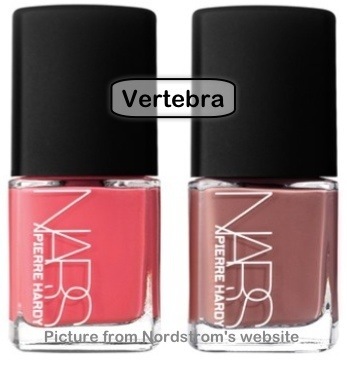 Nars Pierre Hardy Duo in Vertebra . One is called left Vertabra and the other is called right Vertabra . These sets are available at Nordstrom and sell for $29. 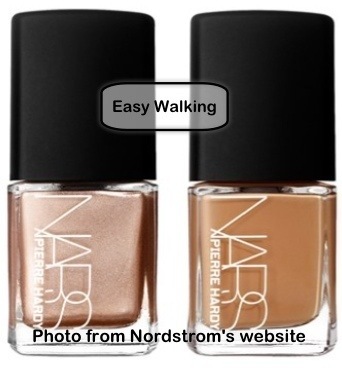 The formula on these are a bit thicker than other Nars polishes I have tried and I probably could have had full coverage with one coat, but you know I always do 2 coats. I was a bit disappointed in these when I received them because I ordered from the website and both colors looked to be a bit more pink than they actually are. The one color is pretty much full on orange and I would never have ordered that, had I known. But I am keeping these because they are just too cute. I think the packaging is adorable and you know me, I’m a sucker for cute packaging. 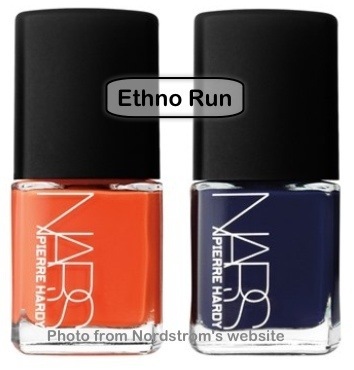 And for $29 for 2 bottles of Nars polish is not a bad price. Let me know if you pick up any of these sets. This is my pick for Week 20 of the Nail Polish Lottery Club. The number drawn this week was 175, and believe it or not, I do not have 175 un-trieds polishes, so I had to use the alternate number of 1+7+5=13. if you do not know what the Nail Polish Lottery Club is about, I will leave all the info at the end of this post. 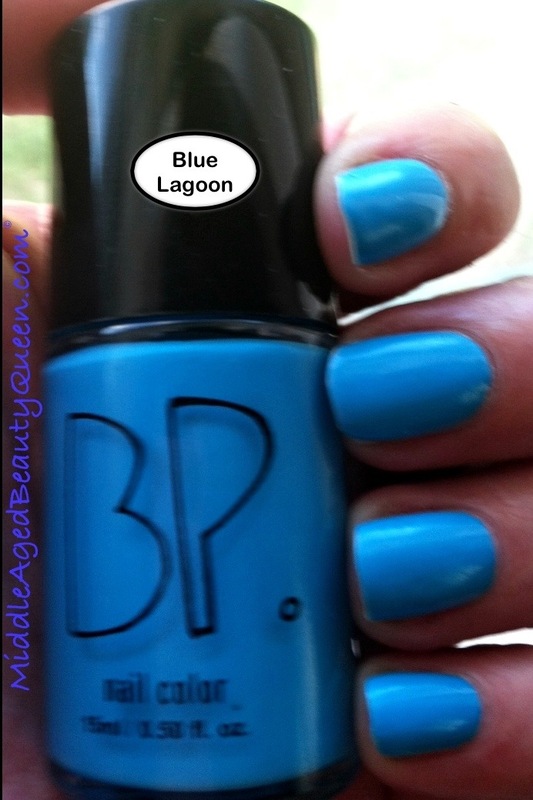 BP Blue Lagoon ( this is a Nordstrom brand, I believe it’s a Brass Plum line for them), which if you are not familiar with Nordstrom the Brass Plum is the section of the store for pre-teen girls. A section I haven’t shopped in for years. Norstrom also has another brand of their own polish call Norsdstrom, the bottles look like the Cover Girl bottles, I haven’t bought any of those to try. 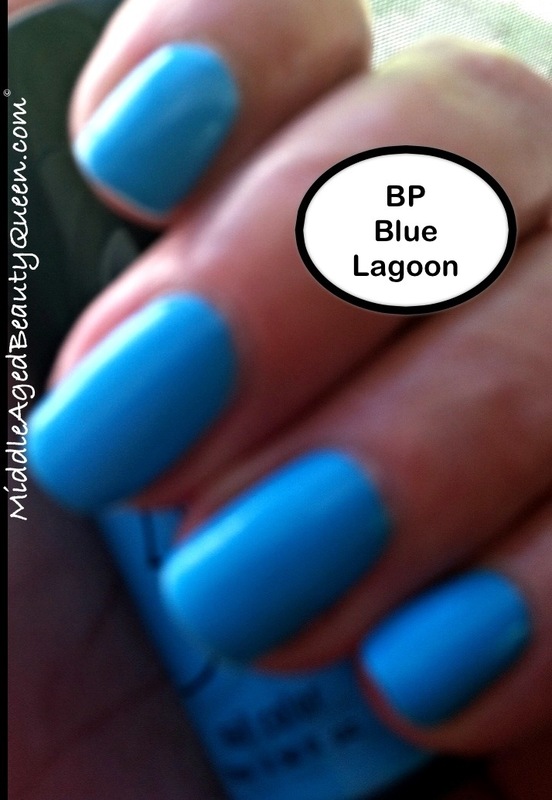 But I really liked this Blue Lagoon. It wore very well, for such a bright color there was hardly any tip wear and one little tiny chip on my thumb. Which I think is from texting because I seem to get small chips on that thumb a lot. I will be buying more of the BP brand of polish because they were not expensive at all. I bought 2 bottles as they were having a BOGO. 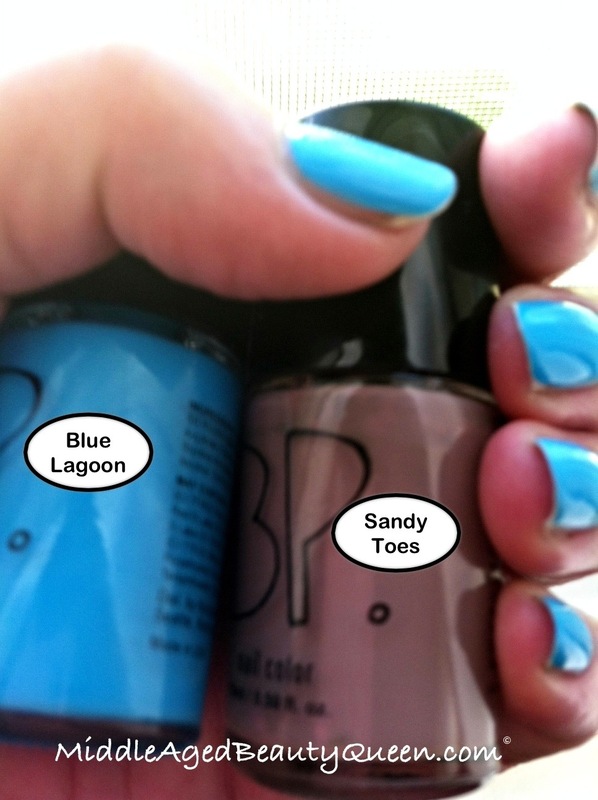 I bought Blue Lagoon and Sandy Toes. The BP polish are .5oz and sell for $5. You can find them at Nordstrom, which is having a special on them right now, if you buy 3 you get a dollar off. I think these are worth checking out. I know I am very happy with the ones I bought. For more information about The Nail Polish Lottery Club please go to https://docs.google.com/document/d/1PJtYOL0VJjvrrfDVgK-3GSnjCcuyRDdj0Gb9IZKMjQA/mobilebasic for all the guidelines. There are no rules and everyone is welcome. If you want to participate weekly that is great but please don’t feel like you have to. If you want to share with us once a month, that is fine. Whatever works best for you, works for us. 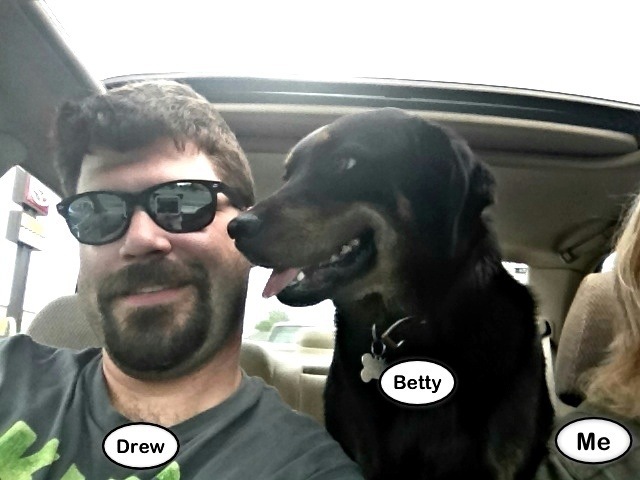 Drew, Betty and I driving to Jilly’s house on Mothers Day. I had all my kids with me, it was the perfect day for me. Thanks Drew, Jilly and Betty!